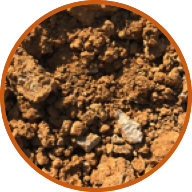 Screened Topsoil is just that; a screened native topsoil that is blended with sand and SILT from a river to replicate the properties of sandy loam. 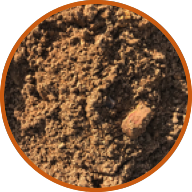 Screened Topsoil is most often screened using a 1/2” screen so that no matter larger than 1/2” can pass through. 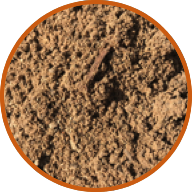 Screened Topsoil is also relatively free of organic matter such as roots. Screened topsoil is easy to rake, shovel, and spread. It's a great choice for the average homeowner who needs yard repair or minor leveling of their yard. It can also be used under grass sod and around the foundation of a house where soil has eroded. 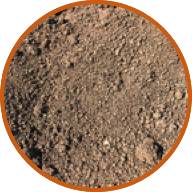 The compost and topsoil blend uses the same screened topsoil described above at a 90% ratio, with the remaining 10% being an organic compost. The compost used undergoes the composting process for approximately two years. The composting process is taken seriously that it is monitored by microbiologist. This is no run-of-the-mill compost! 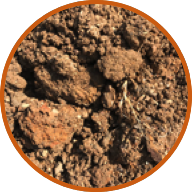 This compost is made from ground wood, leaves, and straw, and is composted with cow manure from local Texas farms for very nutrient rich soil amendment that is great for tilling into an existing soil for great flower beds and gardens. It is also a great material to top dress a thin layer on a yard to boost the nutrients in the ground and liven up the grass. If you are looking for a rich and perfect compost - this is it. This material also is closely monitored by a team of microbiologists, and testing data is available! Select Fill is a special material used most often with building pads. Occasionally, it will be used for trench backfill on a large pipe embedment job. 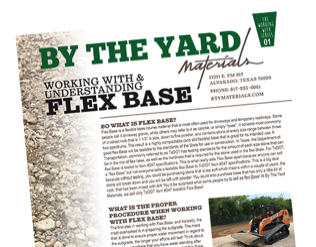 Select Fill is usually a mix of clay and sand that is dug and tossed to get a consistent mix, so that when worked (usually with a bobcat) and compacted, the material will pass required testing for engineer specifications on building pads. Select Fill is generally used on construction sites with equipment, but if you have a big hole to fill in your yard and don't mind the work, this is a cheaper alternative to Topsoil. Common Fill is the most basic of materials and is typically a clay based material. 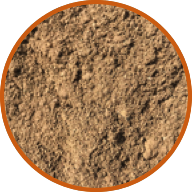 It can contain clay, sand, stone, rock, roots, and even concrete. It is not recommended for most applications, but it is good for filling in large holes. This material is most commonly used just as the name states: by brick masons for the mortar on brick work. 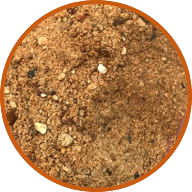 It is a screened and washed material, which, combined with the medium coarseness of the sand, also works great for play sand boxes, volleyball pits and even horse arenas depending on what you are looking for. It can also be used as a topping over decomposed granite before setting flagstone or paver bricks. 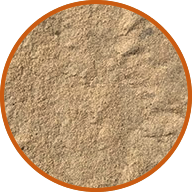 Concrete Sand is a washed sand used to mix concrete. Concrete Sand is a coarser material than brick sand, and meets ASTM C33 specifications for uniform application in Concrete. 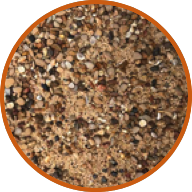 This is a very fine, clean, screened sand that is perfect for play sand boxes, volleyball pits and even horse arenas depending on what a customer is looking for. It can also be used as a thin topping over decomposed granite (which is the base) when setting up a flagstone patio, before setting flagstone or paver bricks. This is also a GREAT and popular material for under above ground pools!!! Despite the name, Cushion Sand often contains at least some small rock and usually has at least some clay content, so it is not just a “sand”. Cushion Sand is primarily used on construction sites for pipe embedment, on building pads around pipe embedment, and under concrete work. It is screened with a 1” screen and will contain some sandstones and clay balls. Remix or Pea Mix as it can sometimes be called is a precise blend of Concrete Sand and 3/8" Pea Gravel that is ready to be mixed with Portland (which we also sale) to make Concrete. 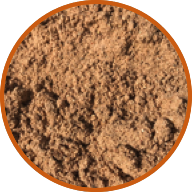 Our Landscapers Blend is a fantastic, plant ready material that is perfect for landscape beds. 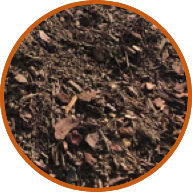 It is a blend of mature compost, sand, and pine bark mulch. With a nearly neutral pH and ideal macronutrient and micronutrient levels, Nurseries use this material by the truck load for planting plants and landscapers use it everyday for spring and fall flowerbed preparation. Testing data is available for this material.